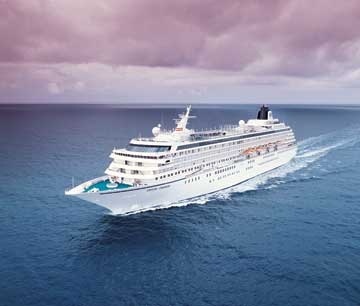 Crystal Cruises ship, the Crystal Symphony, falls into the Ultra-Luxury category. Image courtesy of Crystal Cruises. One of the key elements of a happy cruise is finding the line that’s right for your particular needs. The cruise lines fall into various categories, and to help you navigate the waters (so to speak) of choosing one, we’ve created a guide to what these categories mean. Bear in mind, cruise lines can fall into more than one category, Luxury Expedition, for example, but these descriptions should help to steer you in the right direction. See which lines fall into these categories, and what amenities they offer, by visiting our All-Inclusive Chart. The contemporary cruise lines offer a variety of cruise schedules and itineraries that are perfect for younger adults and family cruises. These are the lines with the largest ships, the most onboard entertainment options, and the widest variety of amenities. This great array of options allows you to choose the type of vacation experience you want once you are on board the ship. These lines offer all the benefits of the contemporary cruise lines, but take things a step futher, with finer amenities and a more upscale environment. Premium cruise lines tend to be large, but not mega-type ships, though they offer similar voyages, plus voyages to exotic locales. Due to the size of these ships, they do not dock in the heart of the town or village like the ultra-premium lines. These lines cater to travelers seeking luxurious accommodations, enhanced dining, excellent service, extensive activities, and enrichment opportunities. The onboard experience is sophisticated and the service above average. These lines will have enhanced spa and wine options. They tend to cater to more mature and discerning passengers who are seeking a sophisticated level of service, ship amenities, and accommodations at somewhat higher prices. These lines also offer children’s programs for all ages. Those seeking both classic and modern luxury, contemporary and conservative design, and dining experiences in which the atmosphere is as important as the food and wine. Families wishing to travel with young children where the environment is a little more subdued. The ultra-premium cruise lines tend to have smaller ships and offer voyages to popular ports, and unique itineraries featuring smaller, less-traveled destinations. They primarily cater to discerning passengers who are seeking a sophisticated level of service, ship amenities, and accommodations at upscale prices. Some lines may offer numerous included amenities. These lines are generally priced higher than the premium cruise lines. Travelers looking for a boutique experience with a destination immersion. Travelers who find the small touches make all the difference—from the service to the food to the ships themselves. These are high end cruises, both in price and in amenities. They are designed for those who desire the finer things in life and have the budget for luxury. These cruise lines specialize in service and will cater to the traveler’s every desire. Small ships fill a niche for cruisers that are looking for more in-depth exploration of the regions they visit. They can visit ports that are inaccessible to larger ships, and exotic itineraries are the standard. Most river cruise ships and almost all of the luxury lines have ships that fall into this category. Unlike ocean cruises, rivers provide easy access to city centers. Passengers sail directly into the heart of every destination and dock in the middle of town, then walk right off the ship and move easily into whatever city or town you are visiting. You spend less time getting there and more time being there. A river cruise allows for a more intimate experience as well. Because most of these ships accommodate only 30 to 200 guests, it is easier to meet your traveling companions. You can share a drink with the couple you met on the day’s tour or dine with interesting passengers in an open-seating restaurant. Another benefit: you can also forget about waiting in long lines to embark, debark, or have a meal. These river cruises are immensely popular and keep growing. Many lines have begun adding amenities previously restricted to ocean cruise lines, such as French balconies attached to the rooms. Those seeking an immersion experience of the regions they visit, in wine, food, and culture. The hotel barge became popular in the 1960s, and has now grown into a very large network of hundreds operating on the rivers and canals of France, Belgium, Germany, Scotland, and the UK. These luxury hotel barges vary greatly in size, configuration, scale and quality of accommodations, and standard and amount of catering. The largest barges take twenty-four guests, the smallest just four. All hotel barges have a high staff-to-guest ratio, but the smaller barges typically provide more personal attention and perhaps comfort. You can expect to get to know the other travelers well due to the intimate environment. These luxury hotel barges are wonderful for chartering and having your own private vacation. Travelers who enjoy the finer things in life and are looking for a small ship or boutique type of experience. Expedition cruise lines typically attract adventure and unusual thrills seekers. These lines have very unique and exotic destinations such as the Galapagos Islands, Antarctica, and Greenland. Expedition cruises tend to focus on very isolated scenery or wildlife up- close and personal. On an expedition line, you will experience undergo a multitude of new experiences: new cultures, new foods, and new smells, as all of your senses are awakened as and you commune with nature. The amenities range from simple accommodations to ultra-luxury environments. Those who may be willing to forego luxurious amenities in exchange for remote locations with exotic birds and animals.